Lok Sabha Elections: Prime Minister Narendra Modi will contest from Varanasi again and the party's national president Amit Shah has replaced veteran leader LK Advani in Gujarat's Gandhinagar. 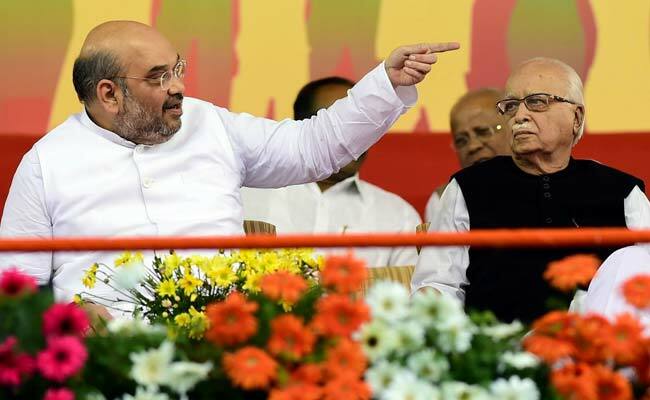 Amit Shah replacing LK Advani is likely to trigger sharp reactions in the political circuit. The Bharatiya Janata Party today announced its first list of candidates for the national elections. Prime Minister Narendra Modi will contest from Varanasi again and the party's national president Amit Shah has replaced veteran leader LK Advani in Gujarat's Gandhinagar. Home Minister Rajnath Singh will contest from Lucknow and Union Minister Nitin Gadkari will contest from Nagpur as expected. Union Minister Smriti Irani will take on Rahul Gandhi from Amethi again. The party, earlier in the day, released its list candidates for the assembly elections in Sikkim and Arunachal Pradesh. Bharatiya Janata Party (BJP) lawmaker Hema Malini on Thursday thanked Prime Minister Narendra Modi and BJP president Amit Shah for choosing her to contest from Mathura parliamentary constituency for the forthcoming Lok Sabha elections, adding that she will work hard to bring development in the area unlike others. BJP MP from Mathura, Ms Malini told news agency ANI, "People wanted me to contest from here again, I am thankful to Amit Shah ji and Modi ji for choosing me again. I will work hard and bring development to the area." BJP has released the second list of candidates for the upcoming Lok Sabha elections. The party has fielded Lalubhai Patel to contest from the Daman & Diu seat. The voting for the constituency will be held on 23rd April in the 3rd phase of polling. Alleging that first the party veteran was "forcefully" sent to the ''margdarshak mandal'', the Congress took a dig at the BJP for replacing LK Advani with national president Amit Shah in Gujarat's Gandhinagar. "First Shri Lal Krishna Advani was forcefully sent to ''Marg Darshak Mandal and now his parliamentary constituency has been snatched," Congress's chief spokesperson Randeep Surjewala was quoted as saying by news agency PTI. Sujay Vikhe Patil, who quit Congress recently, has been offered the seat he wanted to contest from - Ahmednagar in Maharashtra. The seat was a point of contention between the NCP and Congress, which has allied in Maharashtra for the Lok Sabha polls. The exit of Sujay Vikhe Patil, Maharashtra opposition leader Radhakrihna Vikhe Patil, came as setback to Congress. G S Basavaraj filed his papers from Tumkur constituency in Karnataka, hours before his candidature was officially announced by the party in New Delhi in the evening, news agency PTI reported. Anantkumar Hegde, accused of hate speech, will contest from Uttara Kannada. As BJP announced its first list for the national elections, Union Minister Nitin Gadkari said he will win with a better margin this time. "Party has expressed its faith in me, I will win with an even better margin this time. People of Nagpur supported me last time as well. They are happy with our work, we will do even better after getting elected again," he was quoted as saying by news agency ANI. Union Minister Jitendra Singh will file nominations tomorrow from Jammu and Kashmir's Udhapmpur, he told news agency PTI today. Piyush Goyal is likely to accompany him as he files nominations. The BJP's Central Election Committee met under the Presidentship of Amit Shah on March 16, 19 and 20, the party said in a press release. Prime Minister Narendra Modi, Union Home Minister Rajnath Singh, Finance Minister Arun Jaitley, External Affairs Minister Sushma Swaraj attended the meetings. The BJP has finalised 17 candidates in Bihar. However, the names were not announced today. Union Minister Arun Jaitley has not been mentioned in BJP's first list. Party's star candidate Hema Malini contests from Mathura. BJP National President Amit Shah has replaced the veteran leader LK Advani this time in Gandhinagar likely to trigger sharp reactions. LK Advani soon started trending on Twitter after the list was announced. General VK Singh will contest from Ghaziabad and Rajyavardhan Rathore will contest from Jaipur. PM Modi will again contest from Varanasi. BJP's National President Amit Shah will contest from Gujarat's Gandhinagar, and Home Minister Rajnath Singh will contest from UP's Lucknow. Union Minister Nitin Gadkari will contest from Nagpur as expected. West Bengal is another important state for the party where it has emerged as the main opposition party. The announcement by the BJP, ruling at the centre, comes as the nation celebrates Holi. The BJP is said to have finalised all 17 candidates for Bihar. For BJP, which is seeking a re-election for a second term, Uttar Pradesh is an important state. The BJP is pitted against the SP-BSP alliance and Congress in the state, which sends maximum number of candidates to the Lok Sabha. BJP National President Amit Shah on Wednesday tweeted a picture of the CEC meet. Prime Minister Narendra Modi, External Affairs Minister Sushma Swaraj, and Chief Minister Yogi Adityanath can be seen in the pictures holding discussions. The party is likely to announce the names for candidates for Odisha, Jharkhand, Karnataka, Jammu and Kashmir, Rajasthan, Kerala, Tamil Nadu, Assam, Tripura, Telengana, Arunachal Pradesh and Uttarakhand. While the BJP is yet to release a list for Lok Sabha polls, its rival Congress has already released six lists for the national elections. The party, which is trying to stitch an alliance of opposition parties against the Modi government, released its sixth list on Wednesday. The BJP's Central Election Committee (CEC) met for the third time on Wednesday. The CEC is believed to have finalised the names for important parliamentary constituencies.